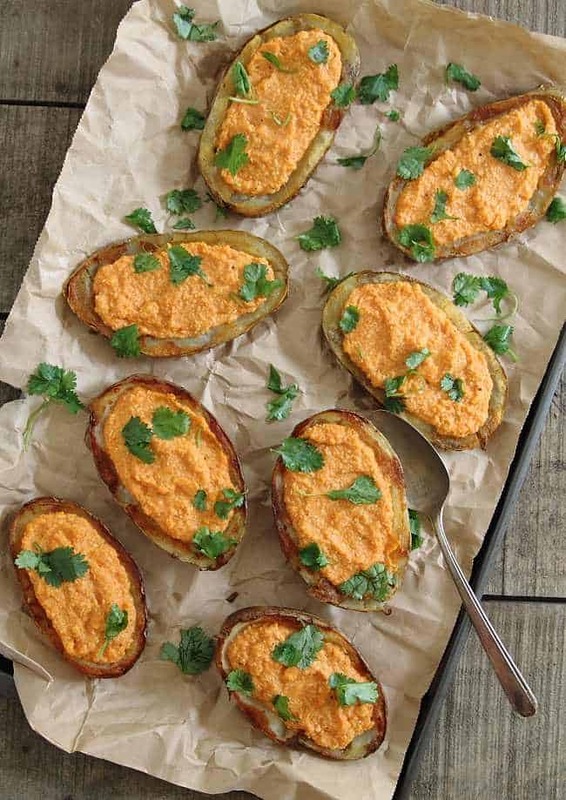 These roasted red pepper feta stuffed potato skins are crispy on the outside and stuffed with a cheesy red pepper filling. The perfect game day appetizer! There are currently three wholesale sized containers of crumbled feta cheese in my refrigerator. While clutter and excess pantry items drive Ulysses crazy, that rationale apparently doesn’t apply when it comes to feta. Every time we hit up BJs, we end up spending about $25 on the stuff so he can live up to his Greek name. And while usually I’m the pantry hoarder, this one drives me crazy. Do you know how much precious realty three huge containers of feta takes up in my fridge? A lot. So obviously, the only answer is to eat it as fast as possible and then delay the next trip to BJs as long as possible. 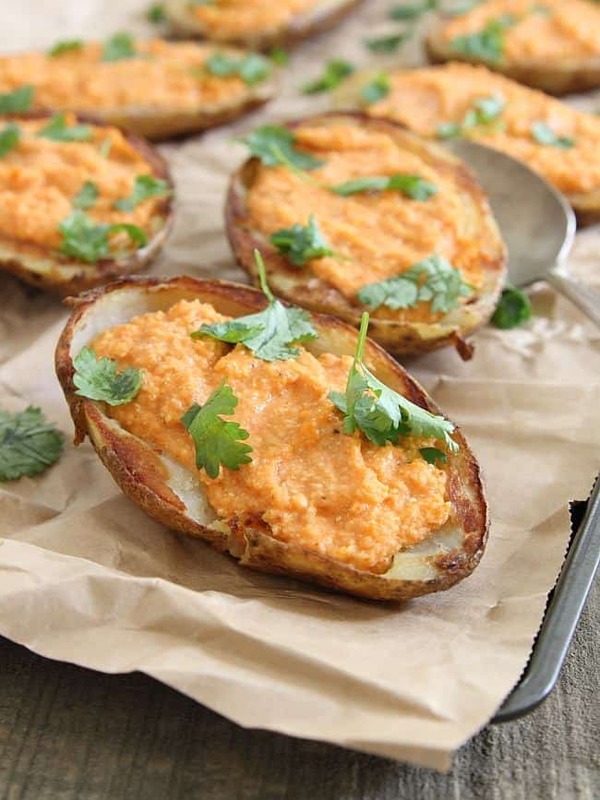 These roasted red pepper feta stuffed potato skins do just that. There’s something super fun about throwing a pepper in the oven, sans any baking sheet or dish and just watching it char to a crisp purposely. Unless you have a gas stove, then it’s even more fun without a dirty glass door standing between you and the pepper. Filling crispy baked potato skins with it and salty feta (and shhhhh…there’s even some cauliflower in there! ), you get the ultimate veg out in front of the tv (I won’t say football, but seriously, this is football food) snack or party appetizer. One container down, two to go. Place peppers on highest rack in the oven and roast until each side turns black. Transfer to a bag, close and set aside. Wash and dry potatoes, drizzle in olive oil, rubbing around the the entire potato, place on baking sheet and bake for about 40 minutes. Remove from the oven and let cool. Once cool, slice the potatoes in half, scoop out most of the flesh (reserve for another use) leaving just a small border around the potato for stability. Drizzle the potatoes in more olive oil, rubbing into the cavity and exterior. Place back on the baking sheet, skin side up and bake for 15 minutes until crispy on the edges. Meanwhile, remove peppers from the bag, peel skin off and remove seeds. Place in a food processor. Add the feta, yogurt, cauliflower, garlic, salt, pepper and 1 tablespoon olive oil in the food processor. 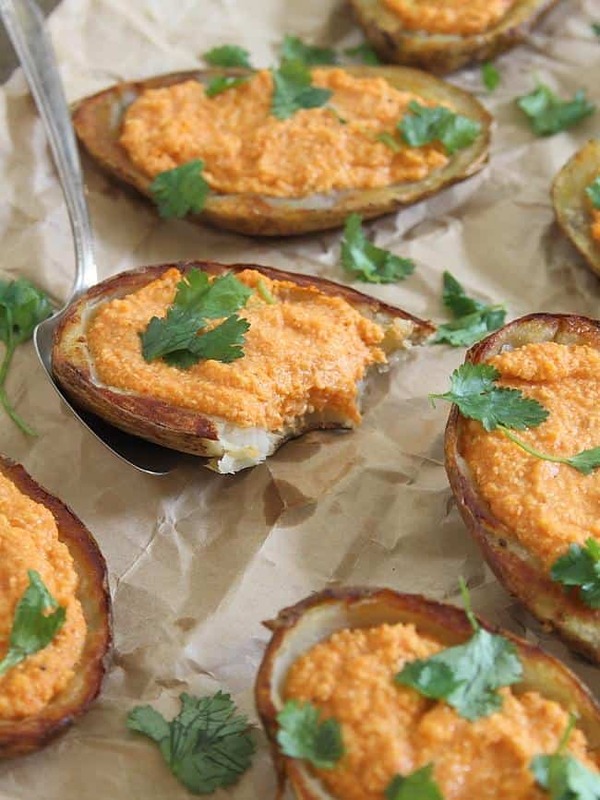 Spoon red pepper filling into the cavity of each potato skin. Return to oven for 5 minutes until heated through. Remove from oven, garnish with cilantro and serve warm. My husband and I have a membership at BJ’s, too! Thanks for this recipe, it looks and sounds delicious! What a great idea for game day or any other day! Thanks for this! Makes me want to throw a football-watching party. i love the unique flavor combo and the fact that this is a healthier game day food. I never would have thought to stuff sweet potatoes like this before! What a delicious idea, thanks for sharing it! Yummy! Looks healthy and delicious! I want to do this with sweet potatoes! Look so good. Oh, my! I want to rush into the kitchen and make these. Is the cauliflower raw or steamed?